Activists greeted her at the jail gates, chanting "Evelyn, you are not alone". 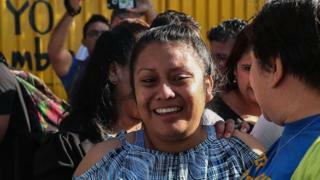 Media caption"I miscarried now I'm serving a 30 year sentence"
Rights organisations in El Salvador says there are still at least twenty other women in jail under the country's strict abortion laws. In the last decade, campaigners have managed to free around 30 through evidence reviews and retrials. Pro-choice campaigners in the Salvadoran group Agrupación Ciudadana welcomed Ms Hernández's release and said they hoped a new judge would consider that there was no scientific evidence to incriminate her. Amnesty International has said El Salvador is "one of the most dangerous countries to be a woman".